Luxury rental Landmark Park Slope will officially launch leasing in July and open for occupancy in August. The 12-story, 104-unit building by The Naftali Group is located at 267 Sixth Street. Pricing at the Karl Fischer-designed property begins at $2,100 for a studio, $2,800 for a one-bedroom and $3,700 for a two-bedroom. The splashy interiors, designed by Andres Escobar & Associates, have floor-to-ceiling windows, white oak floors, large closets and in-unit washer/dryers. The kitchens are accessorized with Caesarstone Quartz countertops, custom cabinets with natural wood finishes and stainless steel appliances. Bathrooms include imported Catalina bathtubs and Spanish porcelain tiles, with walk-in (wade-in?) showers in some homes. As for amenities, residents will get a roof deck with cabanas, lounge, grill areas and views of Manhattan. There’s also a full-time doorman, double-height lobby, furnished and landscaped courtyard, gym, storage space, bike storage and attended parking available for lease. 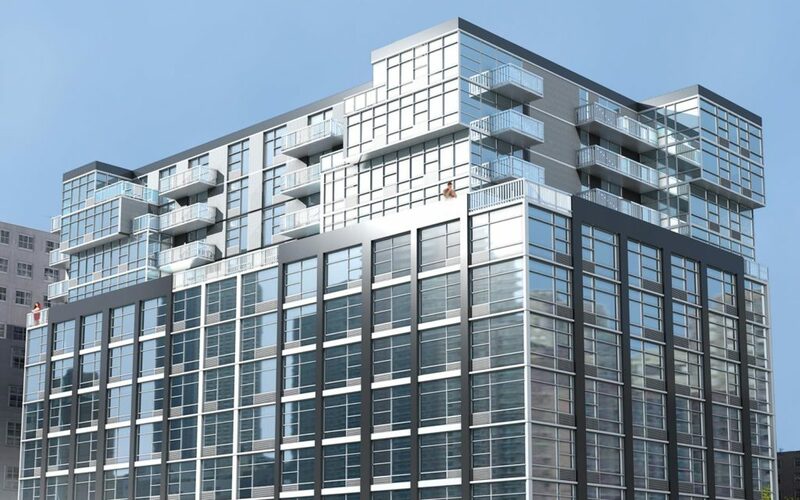 “Our team has paid painstaking attention to every detail within this development to deliver a stand-out residential destination that not only elevates the lifestyle for residents, but enhances the neighborhood as a whole,” Miki Naftali, Chairman and CEO of The Naftali Group, said in a statement.